"You are just a stupid sailor! What on earth do you know about preparing OR survival?! Look at those guys in camouflage! They can lick lichen of a rock!" Well, one thing I learned as sailor is to function well in any group without being an intolerable little git. One of the 100+ feats that comes with being a Chief Officer is an encyclopedic knowledge regarding drinking water and maintaining a high quality of same in a ships fresh water tanks. 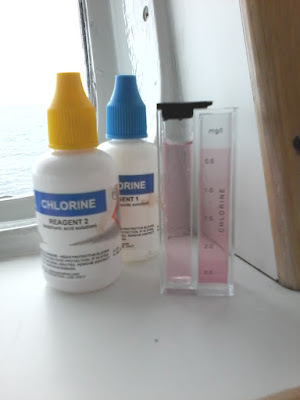 Part of my job is to ensure that our pot water during a voyage stays fresh, is odour free and with neutral taste. Chlorine is the most commonly used disinfectant for drinking water. All over the world it has helped to eliminate waterborne diseases such as cholera, typhoid and dysentery. The near homeopathic amount you need to disinfect water will not affect your health, in fact the WHO established a guideline value of 5 mg/L for chlorine in drinking water. That means that such concentrations are considered acceptable for lifelong human consumption. The "weapon of choice" is Sodium Hypochlorite. It comes in various strengths and you should taken that into consideration when disinfecting water. I strongly advise you to buy a testing kit to make sure that your water has the right concentration. Ideally the chlorine concentration in your water (using Sodium Hypochlorite 15%) should be 0.2 to 0.5 ppm. It takes roughly 1,43 ml of Sodium Hypochlorite (15%) to disinfect 1000 l of water to a 0.2 ppm level. But your water would still be ok for consumption with chlorine levels ten times this high! a simpler one using testing strips.